Winemaker’s Notes: Expressive, deep ruby colour and sweet perfume of white chocolate with a special mineral nuance. Medium bodied with supple tannin as well as abundant fruit. My Review: So, fun fact—the tasting notes that came with this wine and the Castillo Monjardin Chardonnay, weren’t actually for this wine, but for another. Because of that, I wasn’t quite sure what I was getting into when I opened this wine, which is a shame, because it was something pretty amazing. In the glass the wine was a bright red, garnet color. On the nose I picked up aromas of tart fruit, with a touch of spice and mineral as the wine opened up. In the mouth, the Vega Sindoa presented flavors of tart cherry and strawberry flavors. The wine was light, with a hint of smoke coming through at the end of the wine. I really liked this wine, and honestly, the only thing that threw me off was that instead of foil over the cork, there was wax, which I had to sorta cut and chip away before I could open the bottle. Not exactly the choice I would have made, but not exactly a dealbreaker either. I didn’t have any food with this wine, but I think pairing it with a nice ribeye or some other roasted meats would be great. 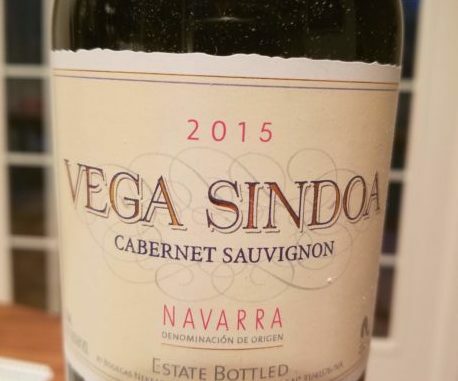 For the price, the 2015 Vega Sindoa Cabernet is an outstanding deal, and it’s definitely one I would buy again.